Grand Duchy is the latest venture from Charles Thompson (a.k.a Frank Black, a.k.a. Black Francis). It’s a duo with his wife Violet Clark that explores relatively off-road terrain for Thompson: high-gloss new wave and vampish synth pop. Grand Duchy’s playful and slightly Euro-affected debut album, Petits Four, is out April 14 on Cooking Vinyl. Thompson and Clark are guest editing magnetmagazine.com this week. Read our Q&A with them. We present to you a playful, genre-bending musical duo, much like ourselves, who are very, very dear to our hearts. Much like ourselves! 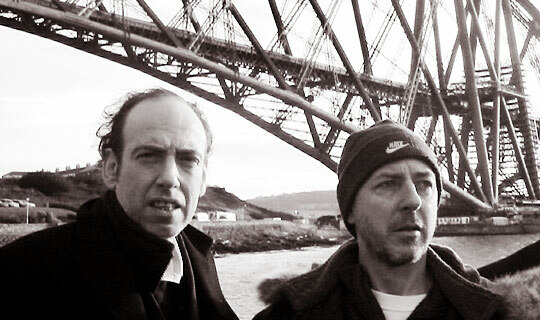 Carbon/Silicon is Mick Jones (from the legendary Clash and Big Audio Dynamite) and Tony James (from Generation X and Sigue Sigue Sputnik). I know—incredible, right? Violet has long admired the realism of Jones’ vocal stylings. You can tell when he’s jumping up and down or tapping his foot while singing. The way it joggles his voice, it’s so visceral. James majored in math and computing in college. A confindent bassist (he created the “space bass” sound in Sigue Sigue), James has dallied on the fringes of pop punk for a few decades now. What make these heroes heroic is that, for all their combined age and experience, the music and the methods of creation are neither jaded nor humorless, nor rooted in past glories. The premise of this band is to embrace, rather than fight, the eminence of the Internet, which is in direct contradiction to the fear and denial of the record labels, who still think they’re fighting the good fight against illegal downloading. Carbon/Silicon make rock music, but they’re making it on their laptops; they release many of their projects as digital-download only; they engage in file sharing; they sample. And their stance on illegal downloading? You can get it all for free from their website! Jones and James aren’t in it for the money. P.S. Black Franics has been a huge Mick Jones fan for years and would be thrilled to have him—or the full Carbon/Silcon duo—produce a Grand Duchy record.